This pumpkin mousse is a fabulous no-bake dessert, although you do cook it a little bit on the stovetop. It’s then chilled and lightened by folding in some coconut whipped cream. It’s not as light as typical mousse, but it is lighter, kind of like a thinner pudding. Anyway, if you have some friends or family with special diets or are keeping your waistline in check this holiday season, be sure to give this recipe a try! You can even make it paleo by changing the honey for maple syrup. 1	REFRIGERATE ALL 3 CANS OF COCONUT MILK OVERNIGHT. 2	CHILL the bowl of a stand mixer and whisk attachment in the fridge (20+min) or freezer (10 min). 3	Remove 1 can of coconut milk from the fridge, turn it upside down and open the can. Pour out the clear liquid into a container to store in the refrigerator for later (use in smoothies, soups, etc.). Scoop out the cream with a spoon and place in a medium saucepan. 4	Add the pumpkin, honey, vanilla, pumpkin pie spice, and salt to the saucepan with the coconut cream. Cook on medium heat until the mixture simmers. Reduce heat to low and simmer for 5 minutes, stirring occasionally. Remove from heat and pour into a large bowl that has been placed inside an ice-water bath (another bowl with ice and water). Stir the mixture to cool it faster. Let the bowl of pumpkin sit in the ice-water bath while you work on the next step. It’s important to keep everything cold so the pumpkin mousse is stiff instead of soupy. 5. Once the pumpkin mixture has cooled, prepare the coconut whipped cream. Remove the remaining 2 cans of coconut milk from the refrigerator, turn them upside down and open the cans. Pour out the clear liquid into a container to store in the refrigerator for later. Scoop out the cream with a spoon and place in the chilled mixing bowl. Attach the whisk to the stand mixer and whip until stiff peaks form, adding 2 stevia packets to sweeten the whipped coconut cream, if desired. 6. Gently fold in ⅔ to ¾ of the whipped coconut cream into the pumpkin mixture, being careful not to over-mix. 8. Top with a little swirl or dollop of the remaining whipped coconut cream, and a sprinkle of cinnamon, if desired. 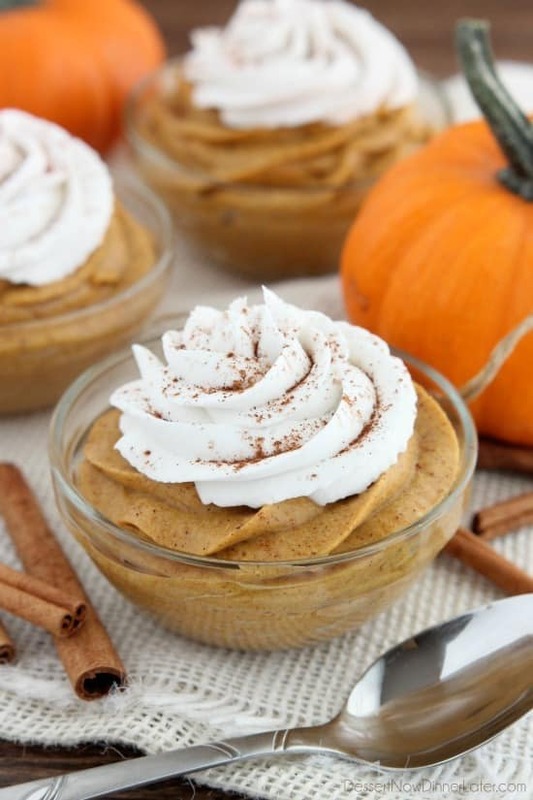 Chill the pumpkin mousse in the refrigerator for an hour or two before serving. Store in the refrigerator up to 1 week in a container with a lid.